« Is free play ‘teaching’ ? When is ‘cold’ too cold? This blog entry is inspied by Juliet Robertson at Creative Star Learning Company. At what point does it become too cold to take the children outside? Working with children in Edinburgh, I have discovered that people assume that if the tempeature is low then outdoor worshops will be cancelled. If this was the case I may as well give up now and start teaching indoors. Scotland is not exactly known for its hot sunny days! As a result my immediate response to this question is NEVER! Here are my reasons why. In teaching outdoor play, bush craft or forest skills, learning about how to deal with outdoor conditions is about learning to take calculated risks. Outdoor play involves ‘dangerous’ play areas, navigating potential hazards and learning to use basic tools. The cold is another potential risk and hazard for the children to come across and learn how to manage. Having worked with adults in the past, I am aware of the numbers of people without any idea of how to dress for cold conditions. This is something that can be learnt from a very young age and something that, if taught would save a lot of lives when people get older and become more adventurous. 1) Can you describe the weather to me today? 2) How could we make sure that we stay warm in the weather today? 3) What clothes could we wear to make sure that we stay warm today? By asking the childen about their own choices of clothing to suit the weather, they then take ownership of their clothing choices and the responsibility that goes with it. This is a huge learning step and so far I have not had a child in my groups unwilling to go out in the cold or be unprepared. It is also a lesson that stays with the child and one that the children remember for future workshops and indeed in outdoor play in the school playground. On a side note, there have been a couple of times I have not taken my children outside. This was due to torrential flooding and howling gales. 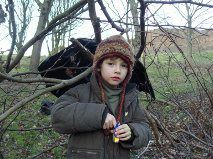 As my work is primarily in forest environments the health and safety of the children has to be taken into account. Falling branches and trees are a real hazard so whilst cold is ok, hurricanes and extreme weather are not. Common sense does have to prevail here. Overall if children are suitably dressed for the conditions and are taught about the weather it can become an integral part of outdoor play and become part of the fun! The key is to ensure that at all times outdoor play is a positive and fun experience for all involved! I have to agree. Whenever it is cold I always ask the children how they feel about going outside as I do have a space indoors that I can use if necessary. I take workshops at a local school and the teachers often think it is far too cold but the children immediately put on jumpers and jackets. The vote with all the children is that they would rather be outside whatever the weather… and they are still smiling at the end!